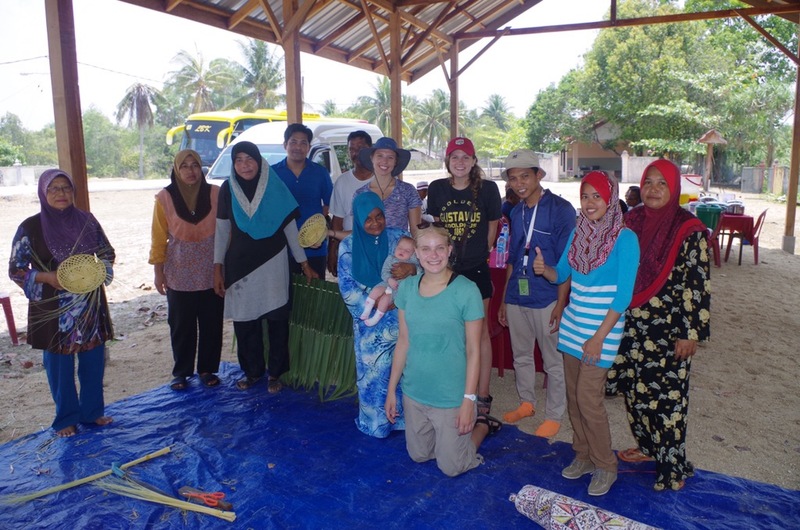 As part of their Tropical Ecology class, the Gustavus Living Diversity program traveled to Malaysia’s Terengganu State and Pulau Redang this past week. Pulau Redang is an island off the northwest coast of peninsular Malaysia, and it’s well known as a beach paradise and snorkel/dive hotspot. We all met at the USM campus late on Tuesday night. Our charter bus departed at about 10pm and the plan was for us to sleep on the bus and wake up at our destination the next morning. The good news is that both kids slept quite readily. As Penelope had cried through the past two nights, I’d been a bit stressed that she would keep everyone awake. She didn’t. In fact, she slept soundly and barely made a peep all night. I had a harder time falling asleep. Our bus continued to climb up mountainous slopes and careen down the other sides, the driver frequently straddling the middle line, only to slow suddenly when oncoming headlights appeared. I think most of us adults were awake. Sometime after midnight, I finally fell asleep. Penelope was on my chest, in a baby carrier, and we both had a good sleep like that until morning. 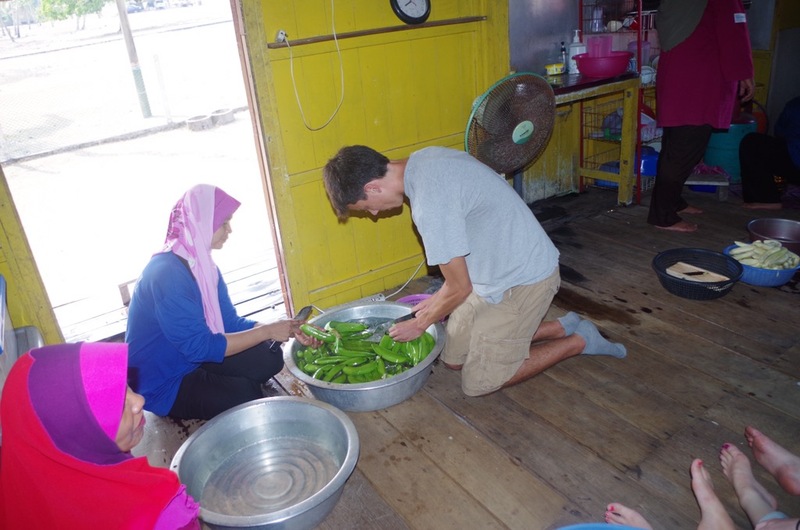 In the morning, we ate breakfast near the mangroves and the students went on a boat tour. Joel and Simon accompanied them, but the professors warned that it would be too hot for a baby. 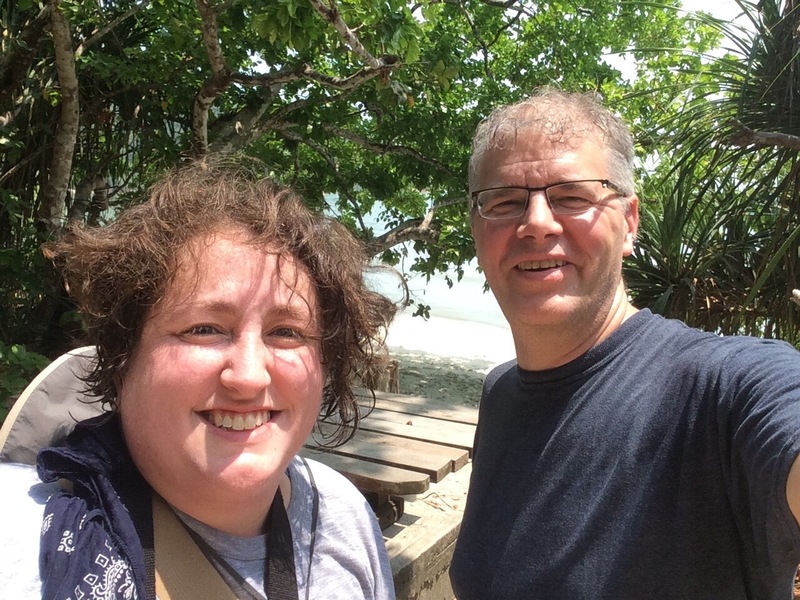 Penelope and I checked into our hotel, the Pandan Laut Beach Resort and waited for their return. The hotel was a simple place with rustic free-standing cabins. I think our group were the only guests, as we nearly filled all their rooms. Penelope and I met up with the gang at lunch time. Some local ladies appeared and taught us the fundamentals of their style of weaving and (of course) offered the products (placemats & baskets) for purchase. Next stop was the Pink House, a womens’ conservation cooperative. 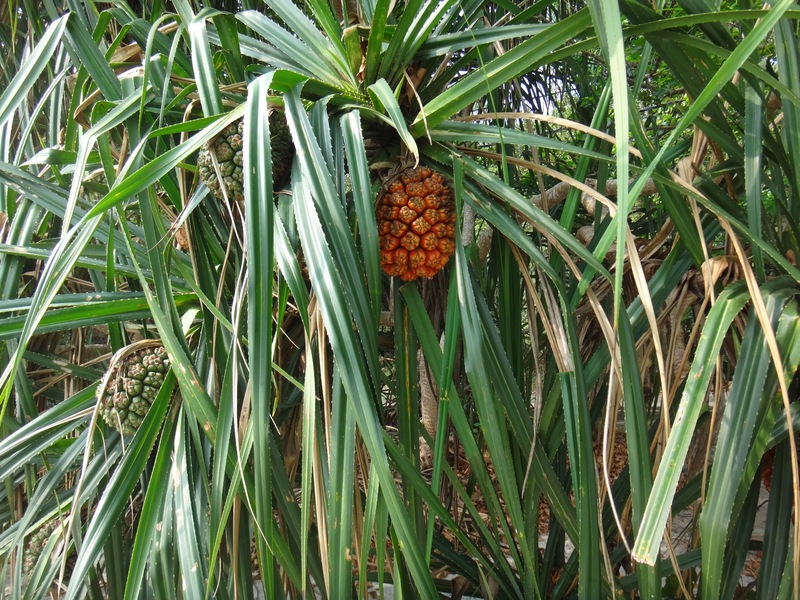 It was started about a decade ago with assistance from Worldwide Wildlife Fund (WWF) and Nestle. Nestlé funded a survey of the socioeconomic needs and existing conditions of communities in key villages in Setiu. The survey identified the local communities’ capacity building needs. 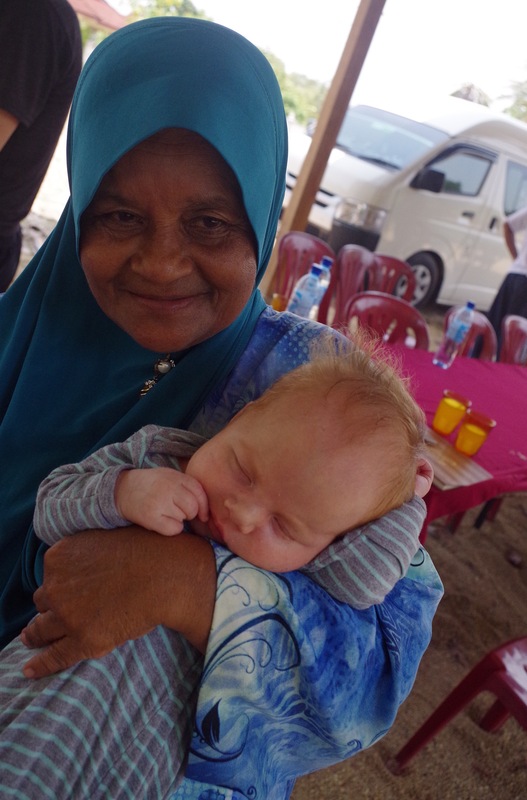 Emphasis was put on the women because, as mothers and co-income earners, they had an important role to play in the area’s long-term development in a sustainable manner. 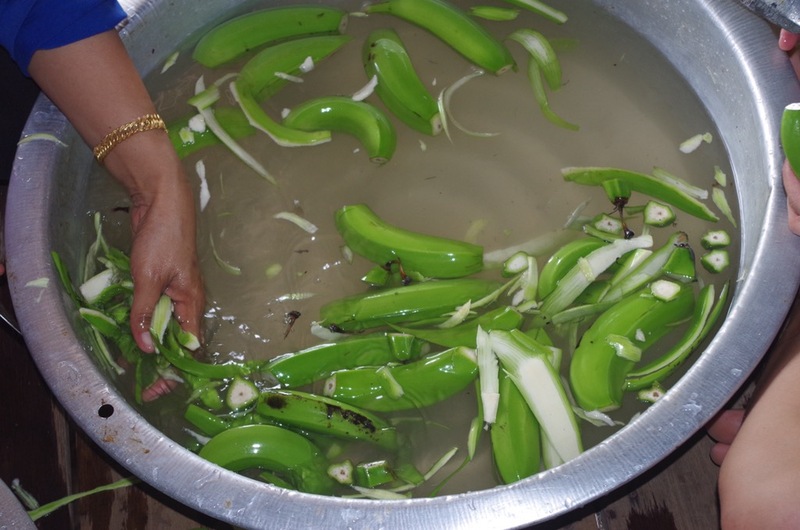 The project entailed equipping local women with the skills needed to develop cottage industries, including training on basic entrepreneurial skills, adopting clean “green” practices in food processing, marketing and branding as well as environmental awareness. 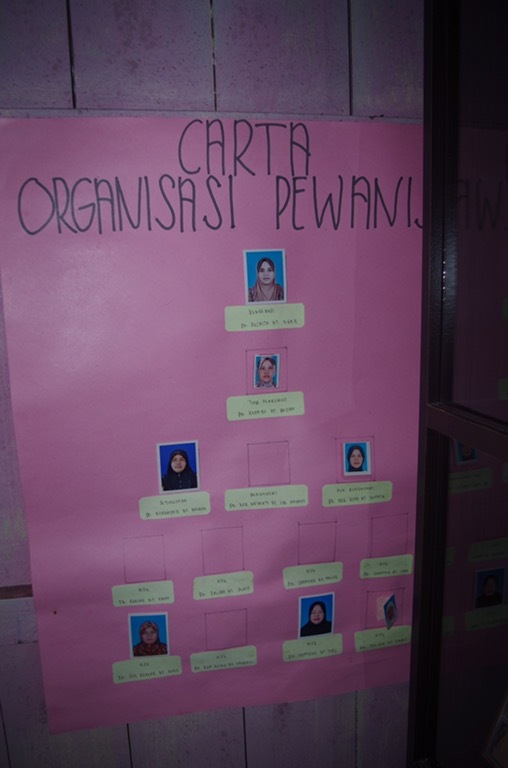 The organiational chart looks a little different in a woman-owned conservation cooperative. 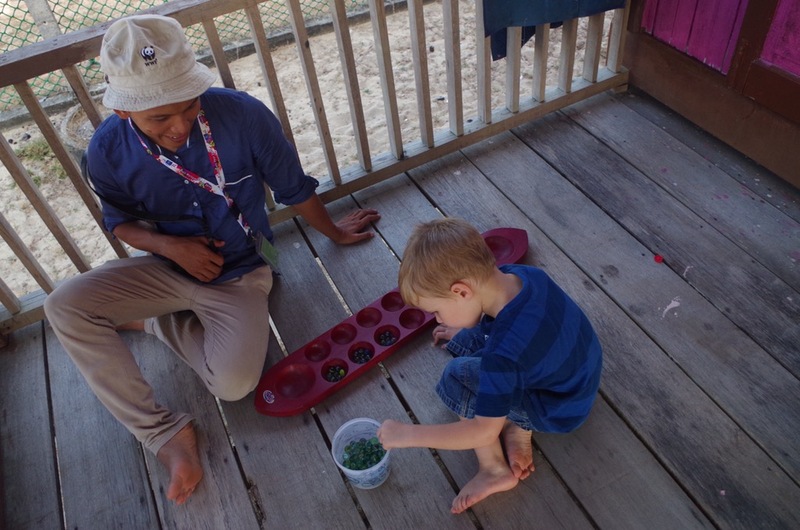 Simon plays mancala on the steps of the Pink House. By all the measures, the venture was successful. 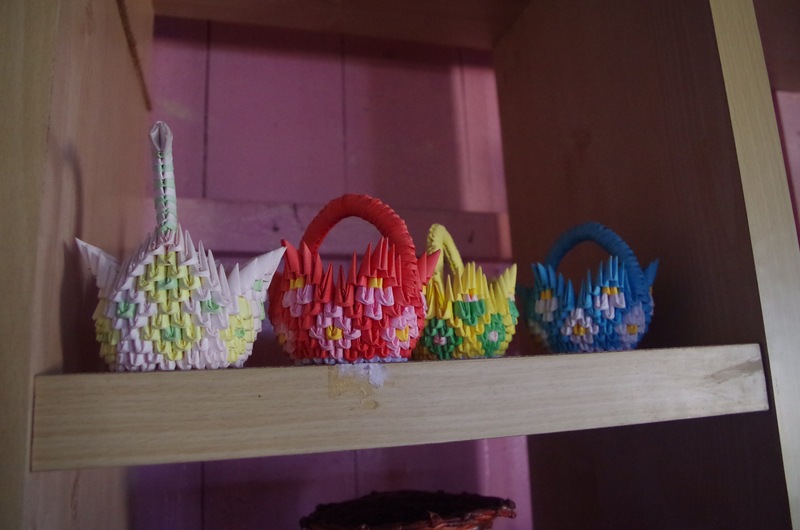 The original funding for the program has expired and the women now work to make the Pink House financially self-sufficient. 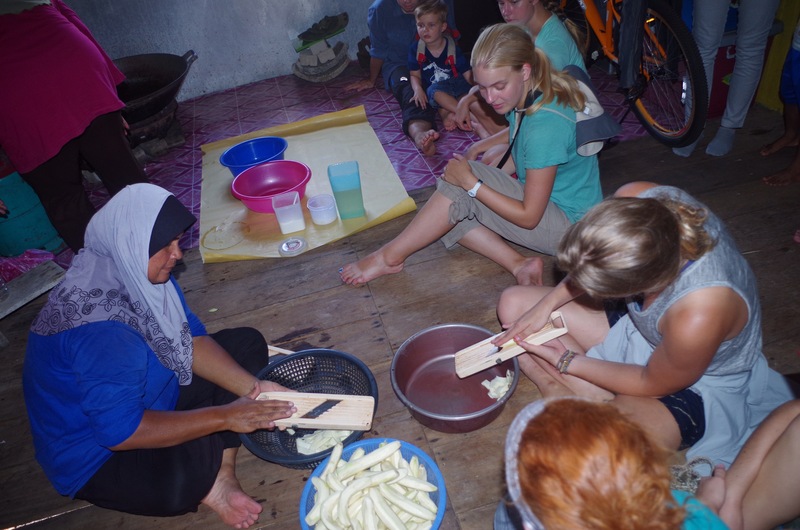 The women there showcased some other handicrafts and taught us how to make the regional style of banana chips. 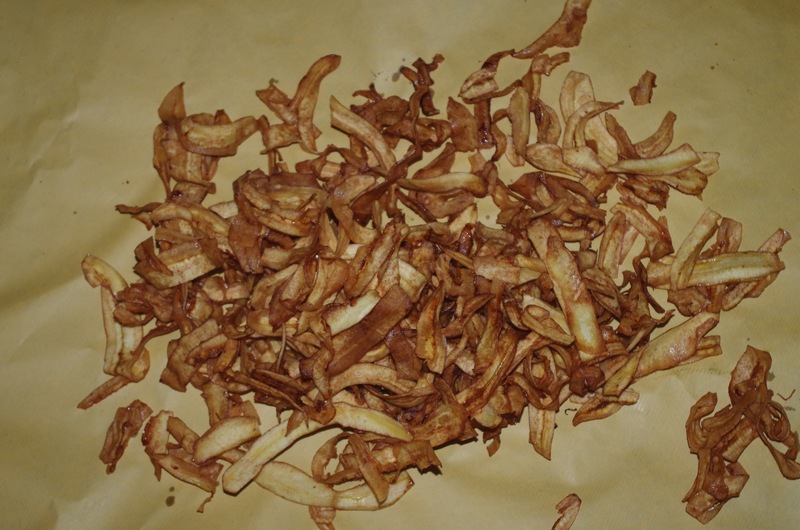 …and fry in oil until they are crispy, golden brown. I’ll admit. I was a bit worried about everyone walking away with their fingers intact. Using a mandolin slicer without your fingers–no grip–is a bit scary. 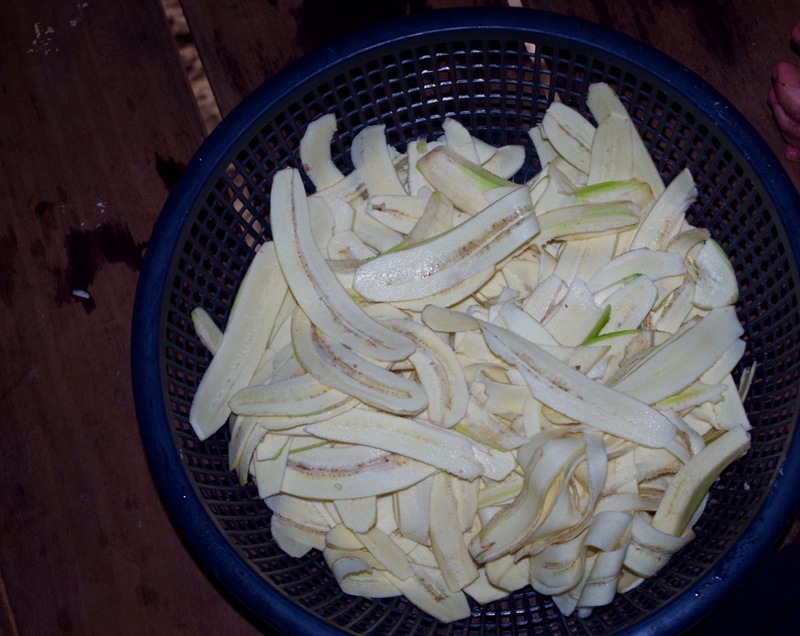 But we were OK. And the banana chips were addictive! The ingredients were: very green, hard bananas, oil, and sugar. So simple; so tasty. Almost everybody walked out of the shop with a few bags to go. I needed my hands free to chop bananas. Fortunately, there were plenty of women available to help me with that. 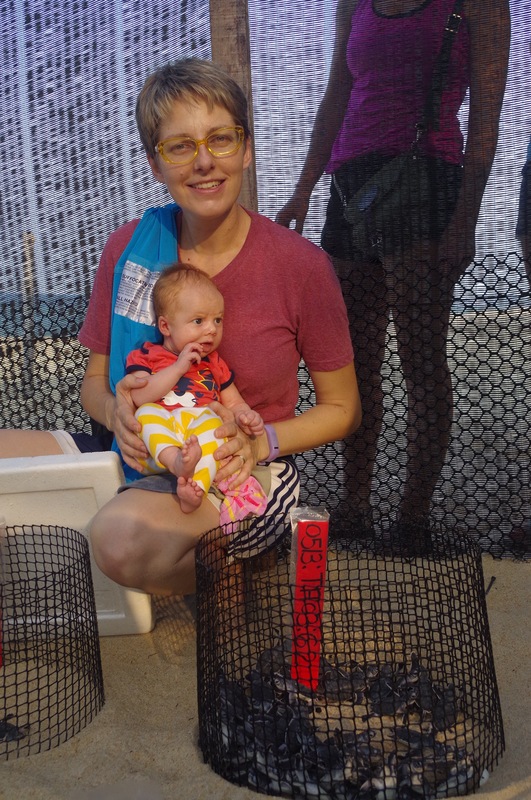 Our last stop of the afternoon was at the turtle hatchery. Around the world, sea turtles are at risk because their eggs are harvested and consumed by local people, who often view them as a delicacy or believe they hold special medicinal properties. 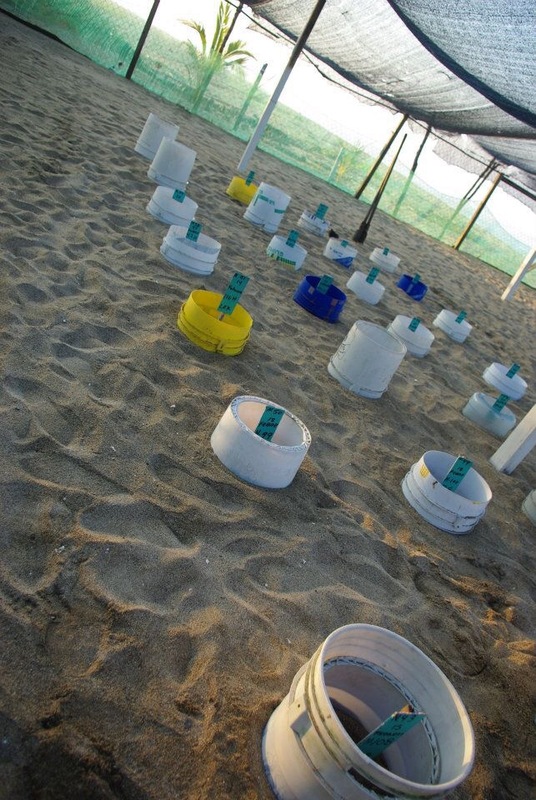 Because of this, it has become a routine practice for conservationists to patrol beaches at night, identify sea turtle nests, and relocate the eggs to a safe spot until they hatch. 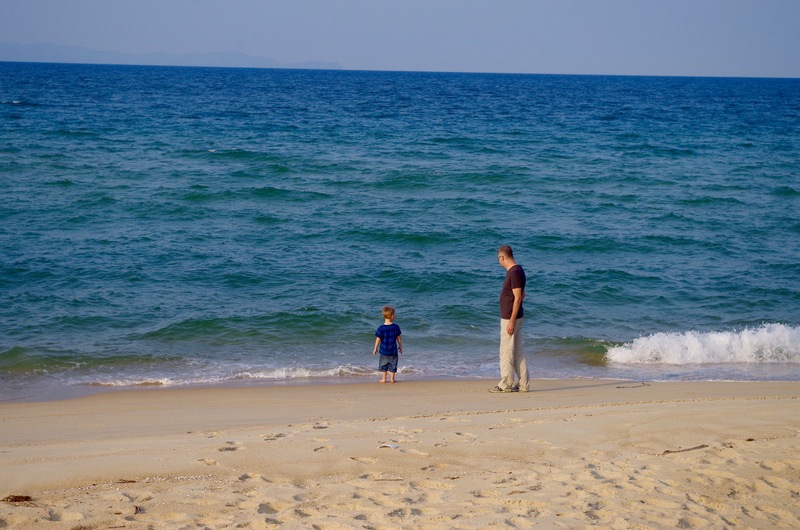 Joel and I saw a nearly identical set up when we visited Petatlan, Mexico, in 2012. 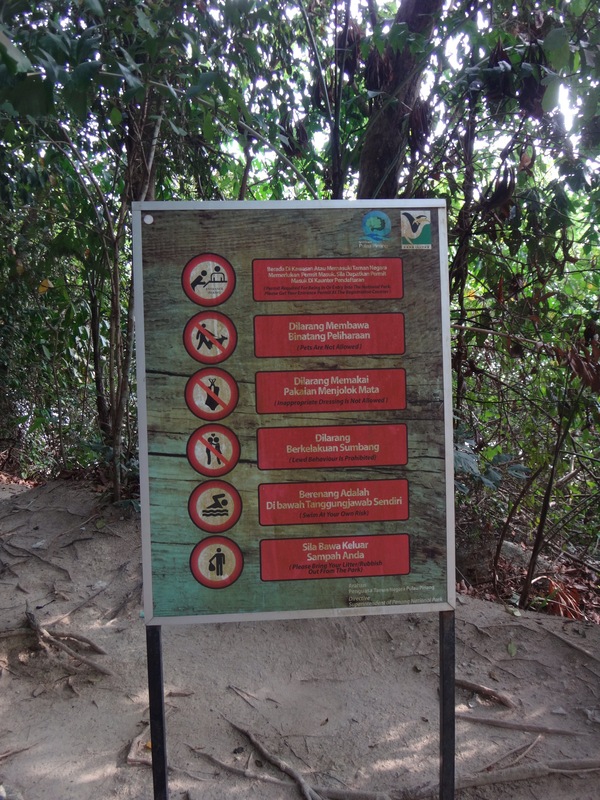 The biologists explained that while other species used to nest in this part of Malaysia, they’ve all been extirpated except for green sea turtles. Much to our surprise and enjoyment, one of the nests erupted and baby turtles started crawling out of the sand as we watched. 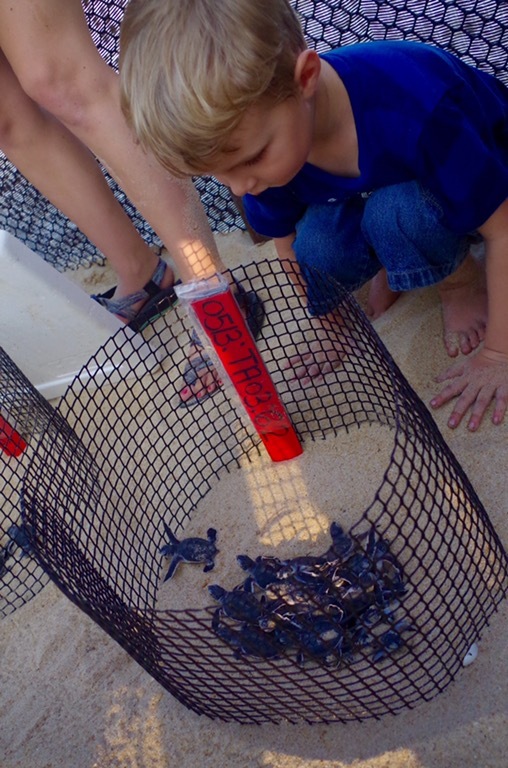 Even better yet, we were told that we could witness the turtles being released that evening at the beach by our hotel. 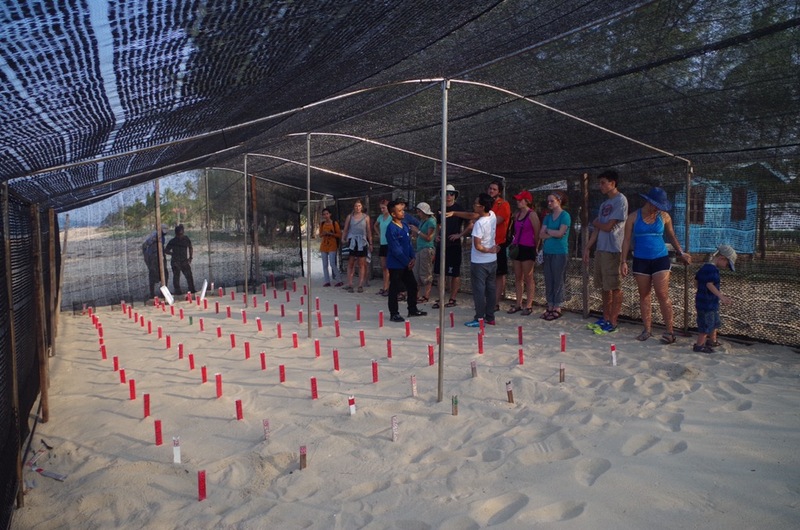 Each red stake represents a relocated nest of turtle eggs, which has 60 to 100+ eggs. The location is guarded around the clock and the fence is sunk into the sand several feet to keep predators out. 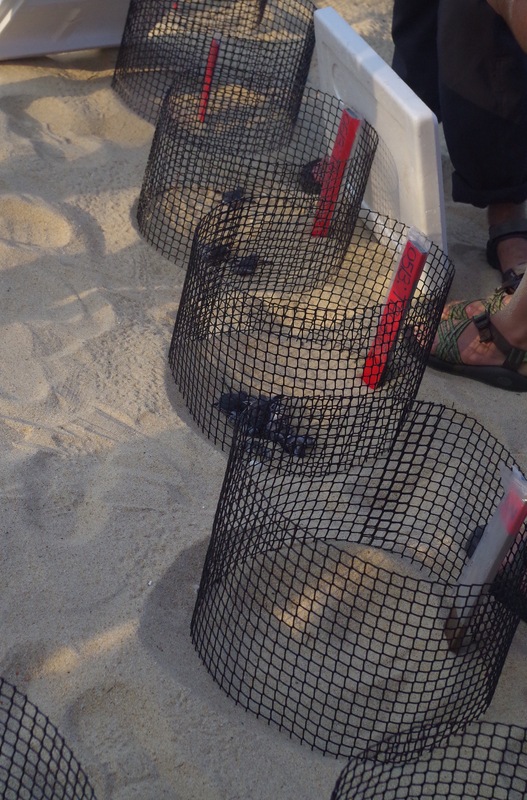 Nets prevent the hatchlings from wandering too far before the biologists can take them directly to their home beach, where their mother laid the eggs. Petatlan, Mexico, March 2012. A nearly identical set-up. These turtles actually emerged from their nest while we were watching. 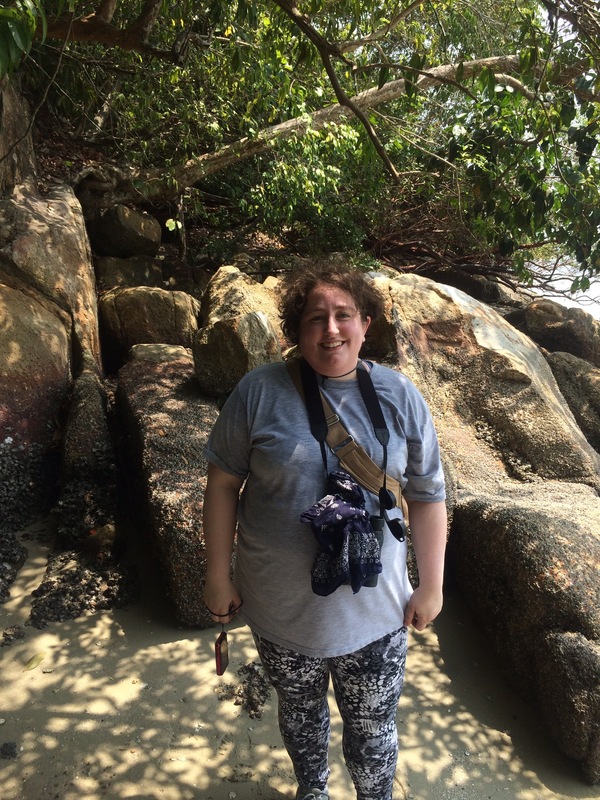 Hanging out at the beach at Pandan Laut, where we would release the baby sea turtles a few hours later. At about 10:00 that night, we all gathered on the beach. We were instructed to turn off all lights and stand completely still and quiet. 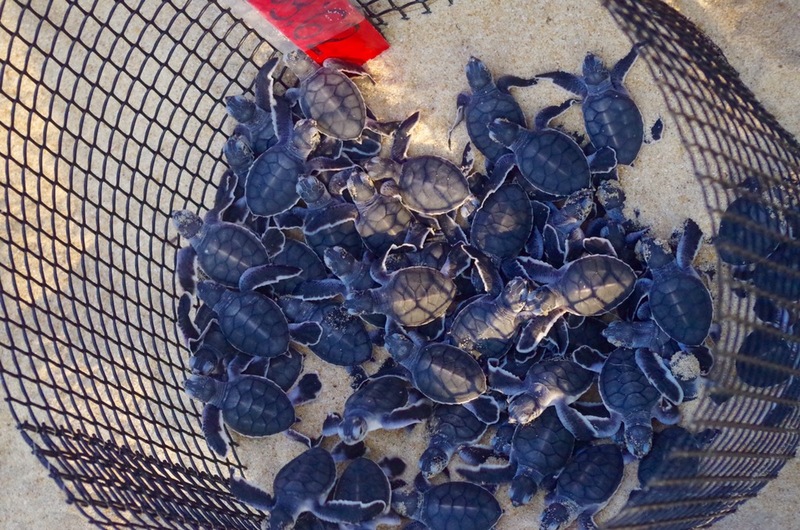 One of the sea turtle biologists uncovered a box full of baby turtles and tipped it over. The little turtles skittered towards the sea. It was so dark we could barely see them, but they crawled along, occasionally bumping a foot or crawling right over. (Yes, it tickles!) No photographs, because the flash would be terribly disorienting to their sensitive eyes. 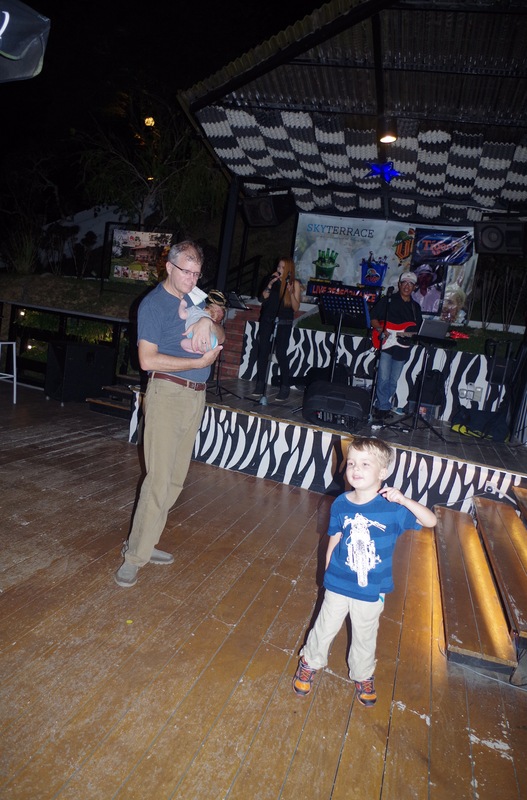 But everyone agreed that it was a highlight of our trip to Malaysia so far. We were exhausted. Something about a newborn baby, I guess? So we stuck around town all week instead. 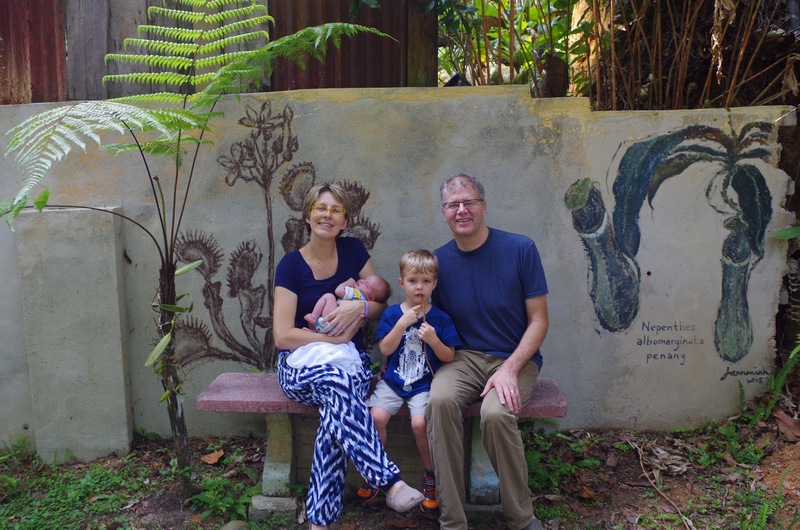 We took it easy, had more doctor’s visits, and tried to get caught up on some work. By the weekend, though, Simon and I were itching for another adventure. 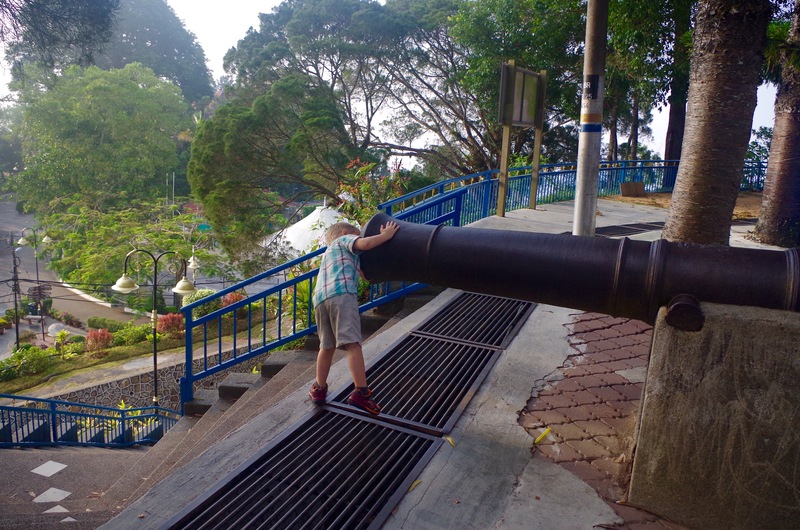 We decided to take a weekend trip up to Penang Hill. 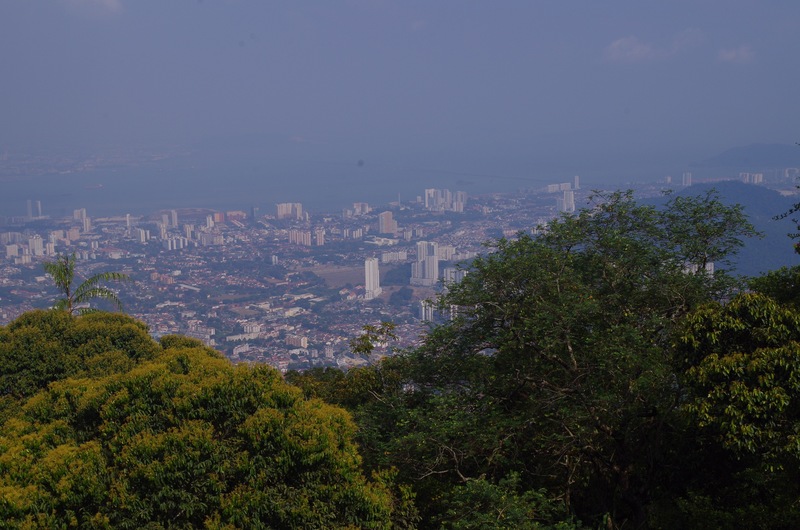 Being some 2500 ft above sea level, the weather at Penang Hill can be quite moderate compared to the low-lying areas of Georgetown and the rest of Penang Island. It first became a popular destination with the British, who would venture up the hill to beat the heat (and the malaria). 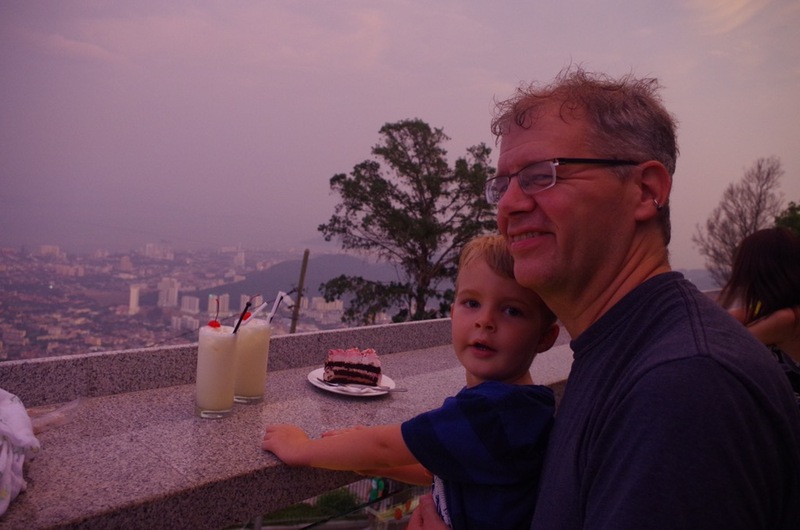 Penang Hill is visible from our apartment window, but it’s taken us this long to get up there. You can walk from the Botanic Garden. A reasonably fit person can make it in about two hours, or so I am told. You have to start early in the day, before the sun gets too high and the heat too intense. And remember, it’s uphill the whole way. Frankly, I’m glad to have two little kids as my excuse to not make that climb! The other option is to ride the funicular railway. I’d heard all about it but had to turn to Wikipedia for an explanation. 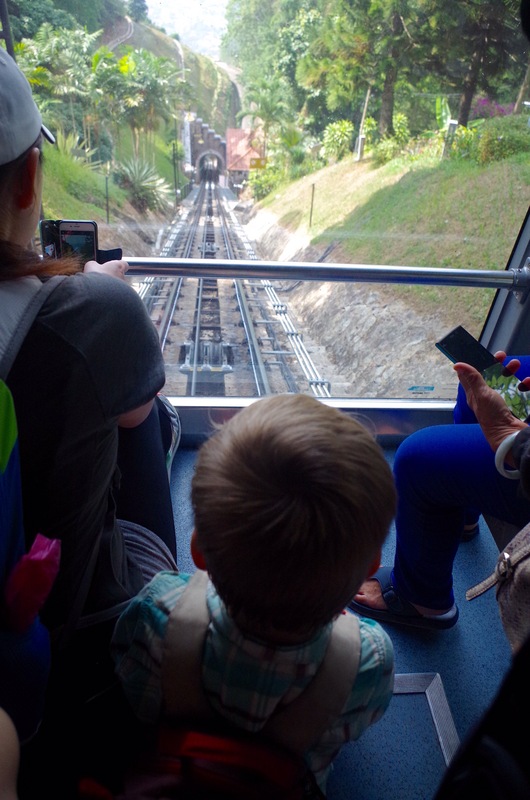 A funicular (/fᵿˈnɪkjᵿlər/), also known as an inclined plane or cliff railway, is a cable railway in which a cable attached to a pair of tram-like vehicles on rails moves them up and down a steep slope, the ascending and descending vehicles counterbalancing each other. Simon was super impressed with the “train.” We didn’t board until after dark, and so we missed out on a lot of scenery on the ride up. This mattered not at all to the 3-year-old. At the funicular train station. 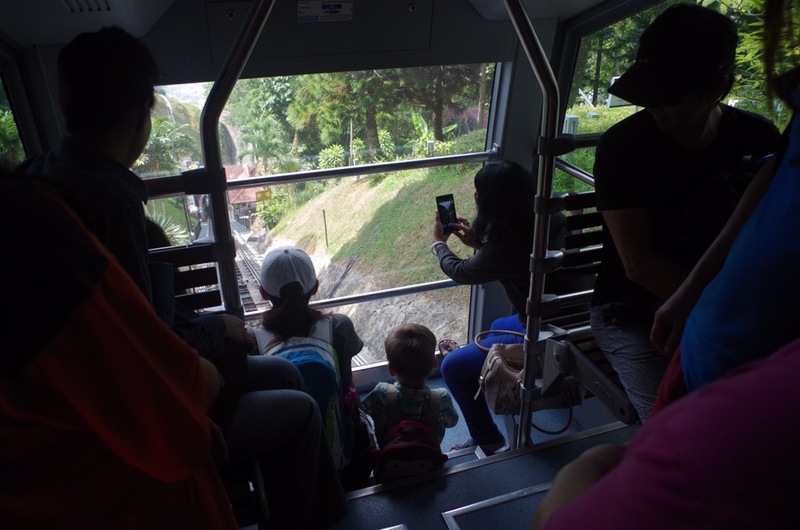 We disembarked at the top of Penang Hill. It was late, and most of the tourists had gone home already, lending a bit of eerie feel to the place. It felt like we were walking around a theme park after hours. 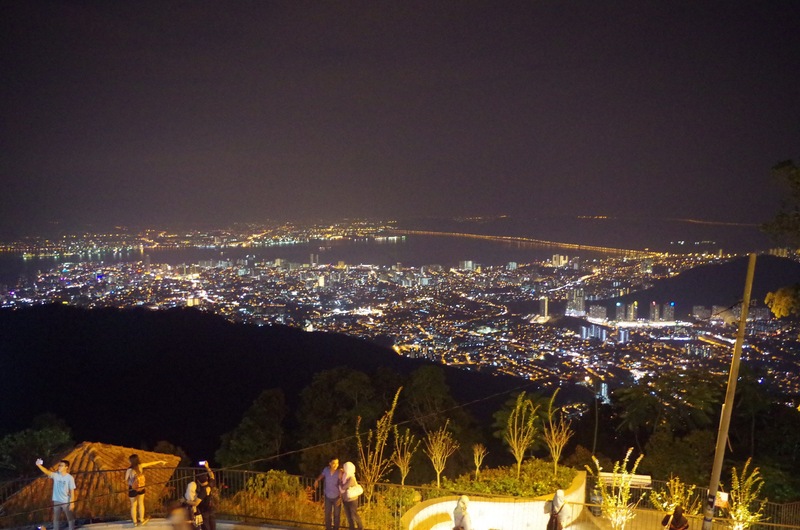 There’s only one place to stay, if you want to sleep at the top of Penang. The Bellevue Hotel. 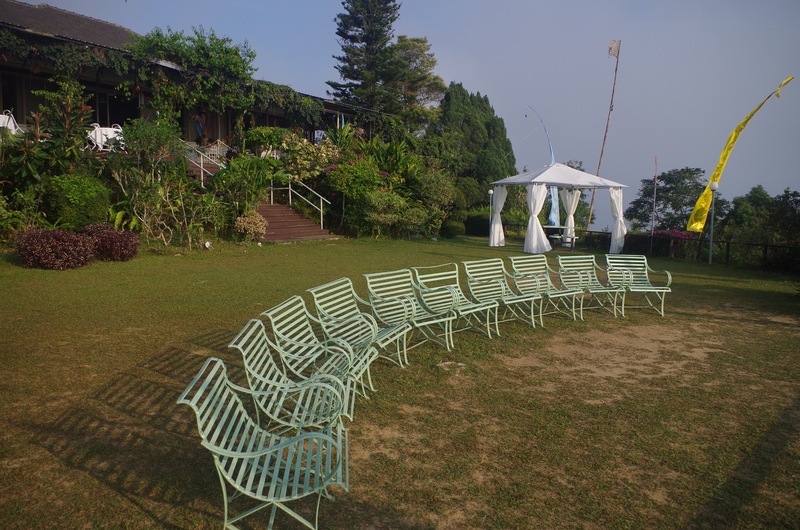 The building was an old bungalow which later was renovated and expanded to form a small hotel. It can’t have more than a dozen rooms and the whole place felt like its prime was past–a bit dusty and grimy in the corners, but certainly an OK place to crash for some sleep. The grounds were quite lovely to walk around and the views were fantastic. Seating for the scenic overlook. 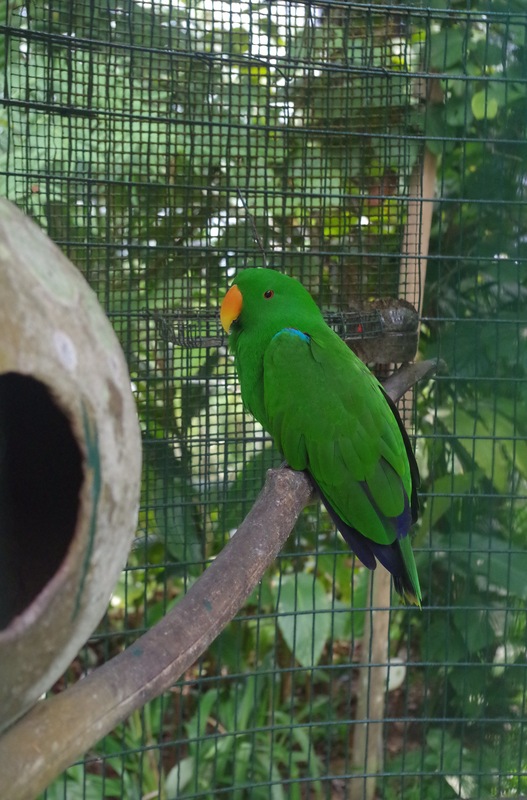 In the morning, we toured the aviary adjacent to the hotel grounds. 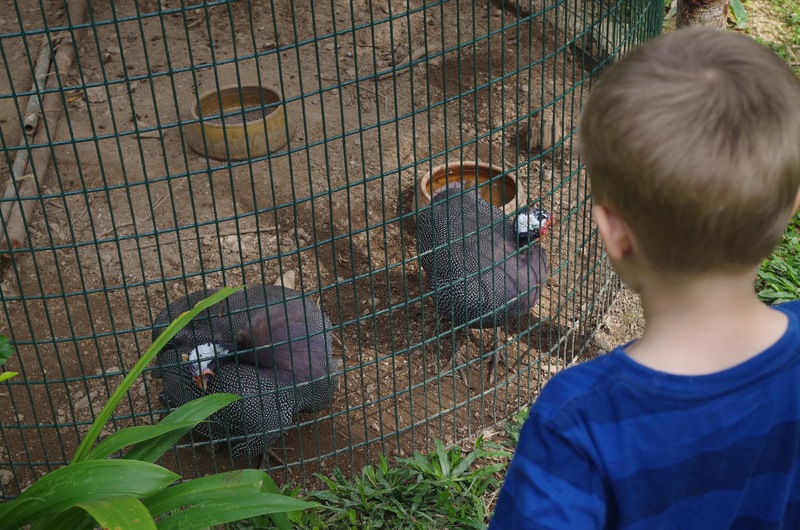 Simon enjoyed looking at the caged birds–he had been startled by the peacocks calling the night before, so it was good for him to get a visual of what made all that noise. Our admission was free because we were guests at the hotel. It was good for a 10-minute walk, but I couldn’t imagine actually paying an admission for the site. They’re basically just weird looking chickens. In other words, they’re not welcome in St. Peter. After the aviary, we found ourselves at the entrance to The Habitat. 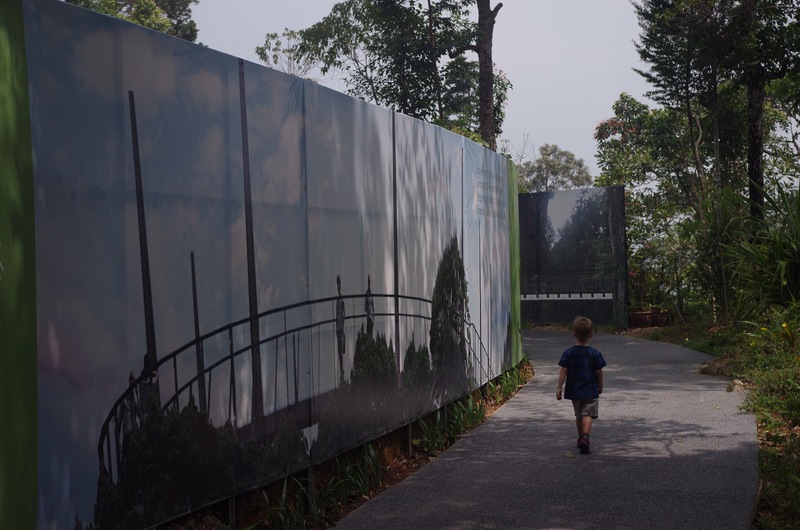 The Habitat on Penang Hill is a new ecotourism site that is still under development. For now, the main attraction is a paved nature walk, about a mile long, along the slope of the hill. 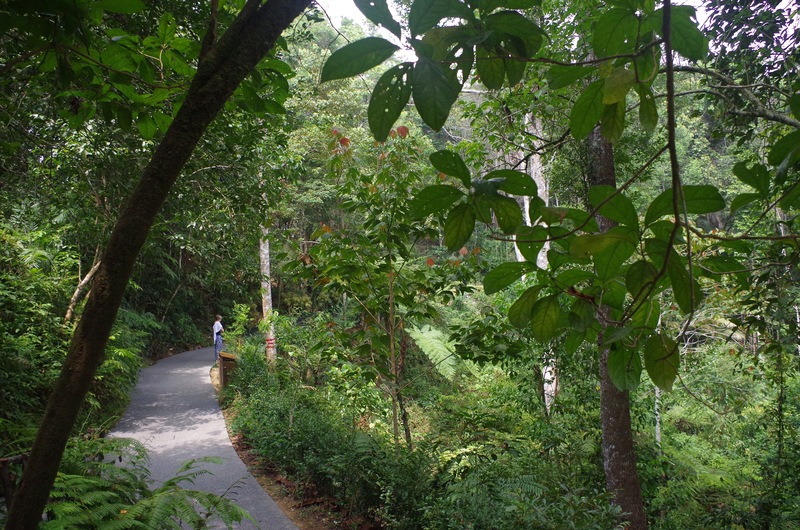 As you walk along, you can peer down the hill and get a sense of the rainforest. We happened to arrive just in time for a guided nature walk, and so we joined just two other guests for that. 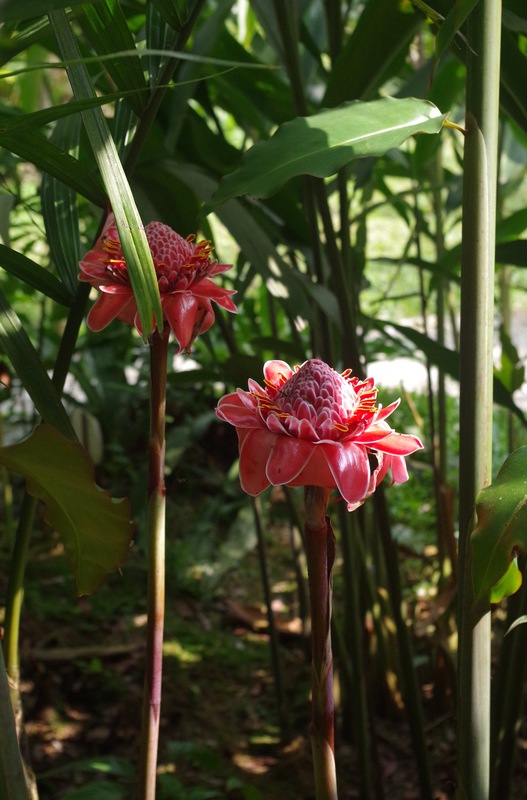 Because the path is paved, and the rest of the park is under active construction, and maybe also because of the cultivated gardens, it feels less like a nature reserve and more like a garden. All the same, it was a peaceful place full of exotic (to us) plants and there was just enough shade that I didn’t feel bad taking a baby on the walk. The park has big plans to bring more “exciting” features, and I’m of mixed opinions on that. The finished park will have a canopy walk and a tree top walk; our guide said there may someday be a zip line as well. 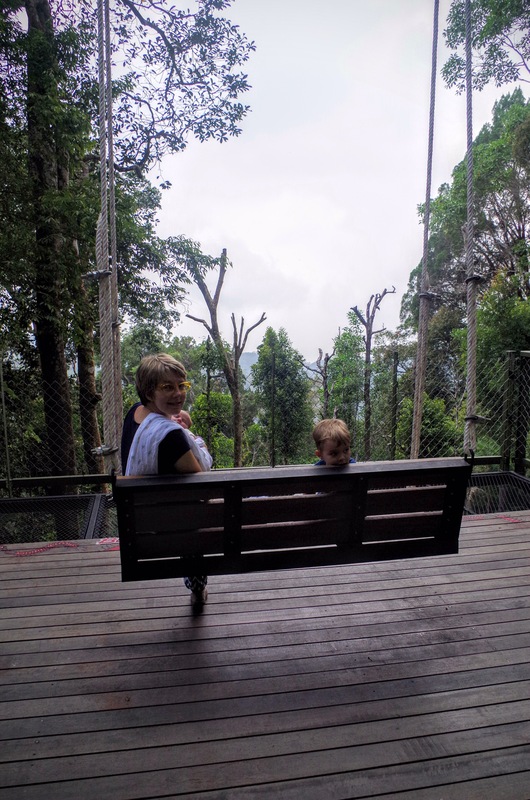 On the one hand, the tree top walk would be a great way to expose people to the biodiversity at the top of a rainforest. I’ve climbed up to the top of the rainforest canopy in Ecuador and it does give you a whole new appreciation. And it would be incredible for birdwatching, if done right. But as with elsewhere in Asia, I wish that tourists would come to visit nature for its intrinsic value, rather than for some adrenaline-pumping overlook and the chance to pull out the selfie stick. 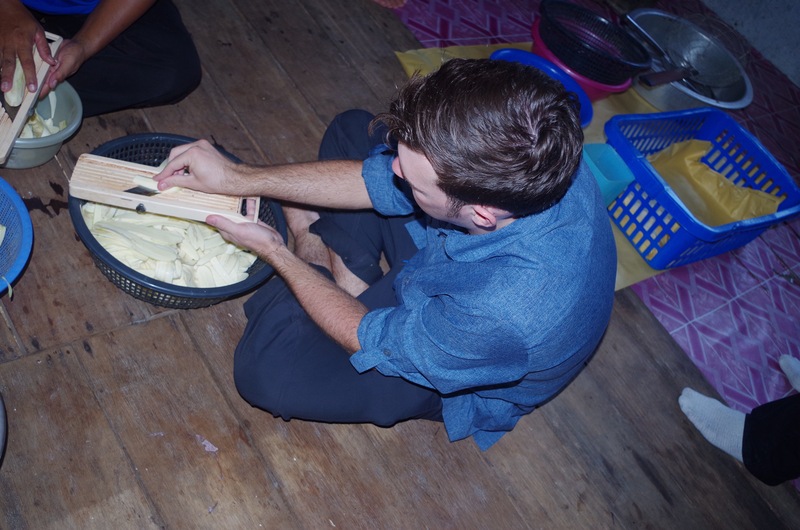 There was one other feature that was already installed and functional, and it was certainly the highlight for Simon. The park had a series of huge swings. 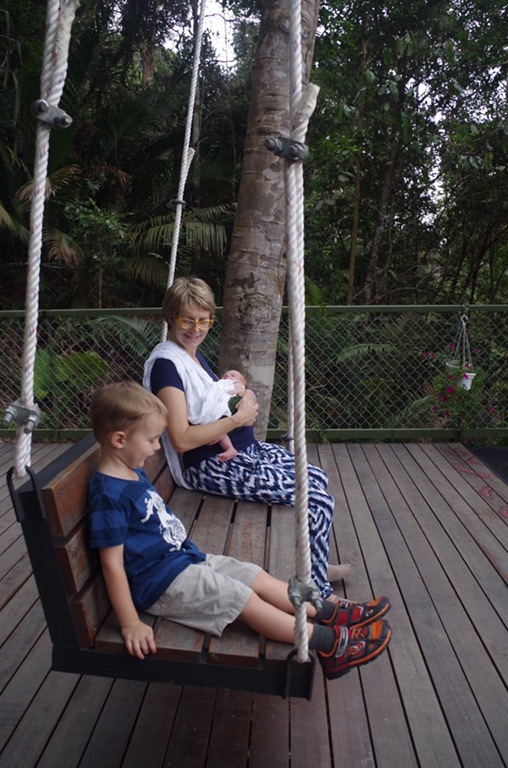 Giant Swings I & II were built onto platforms on the side of the hill, granting you a breathtaking view of the island as you swung back and forth. 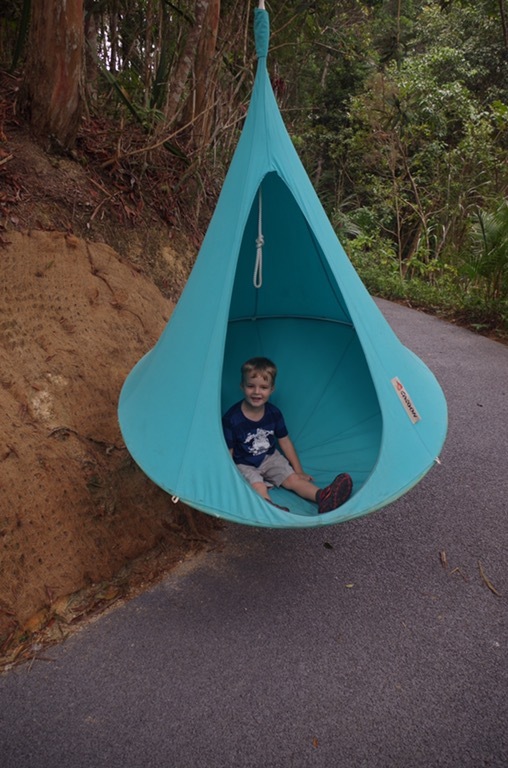 In addition, there were these little pod swings along the walking trail. They are made by a Dutch company. If I had a proper shade tree in my yard in Minnesota, I would definitely buy one! He claimed he could nap in here. If that were true, I’d hang one in his bedroom. 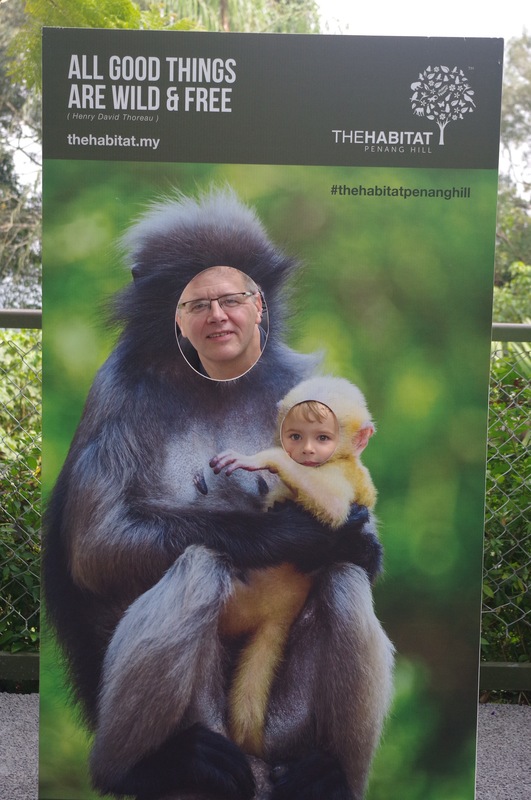 Did I mention there were monkeys at The Habitat? By this point, the heat of the afternoon had caught up to us, no matter the elevation. We weren’t quite sure what to do next. 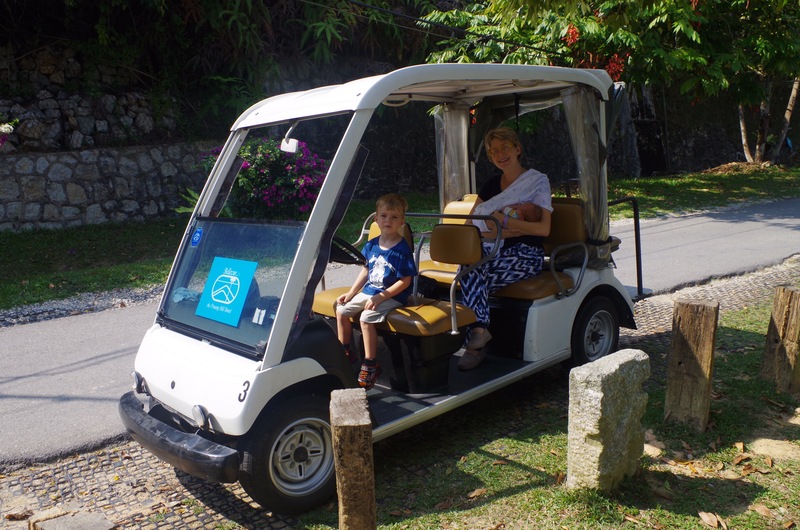 There are these little golf carts that roam all over the top of the hill, offering rides to tourists who can’t be bothered to walk the short distance between attractions. For the record, we are those tourists. We hopped in our eco-friendly cart and away we went! Our driver stopped at each scenic overlook and offered to take some family photos. By this point, the heat of the afternoon had caught up to us, no matter the elevation. We weren’t quite sure what to do next…wait. I said that already, didn’t I? Well, in truth, it was time for some of us–any of us–preferably ALL of us–to take a nap. 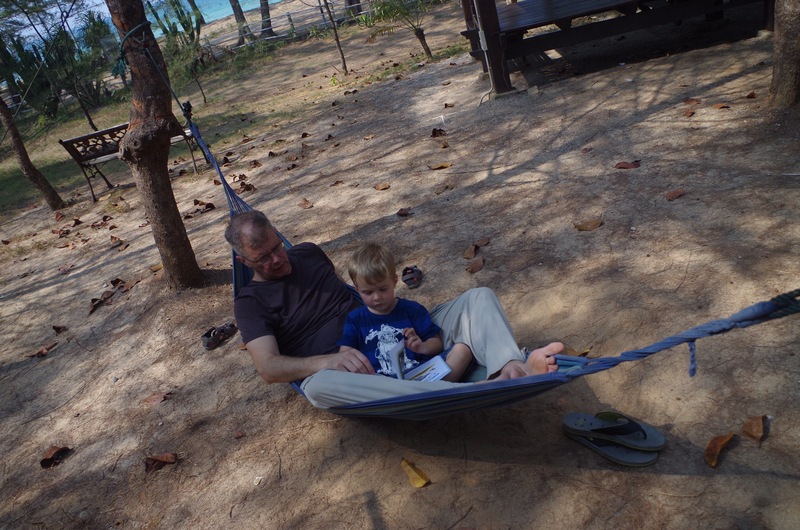 But the 3-year-old was highly resistant to the idea of anyone resting. So instead we sat in our hotel room and begged/bribed/threatened the boy to sleep, so that we might have the same luxury. No such luck. Sometimes traveling with a little kid is fun. Sometimes you want to throw him off the scenic overlook. All in a day’s vacation, right? For dinner we wandered up to the “fancy restaurant,” David Brown’s at Strawberry Hill. 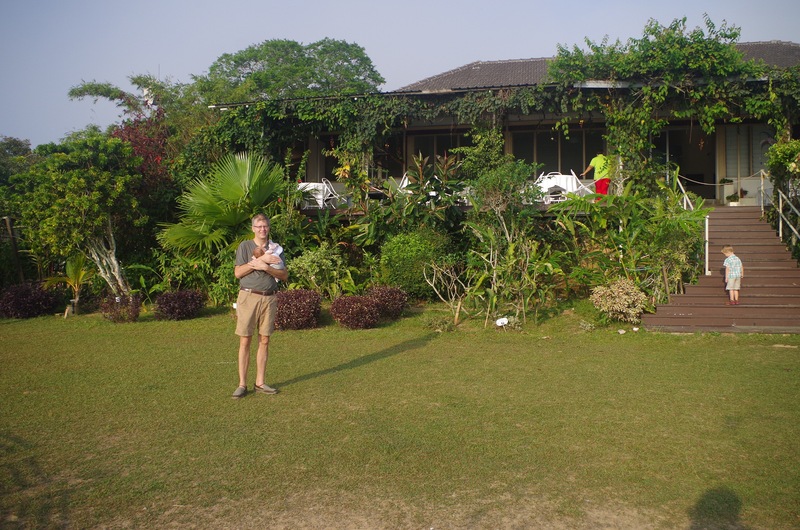 The restaurant is in an old British colonial house, but the real attraction is the garden dining area, with a big lily pond in the middle. It turns out that the place is quite popular. We managed to score the last available table of the evening, as everything else was reserved on a Saturday night. Dumb luck wins again! The menu is quintessentially British; Joel ordered the shepherd pie; I ordered a vegetarian pot pie. Both were good, and we paid American dinner prices, which is quite expensive by Malaysian standards. Musicians were setting up to perform live music that evening. 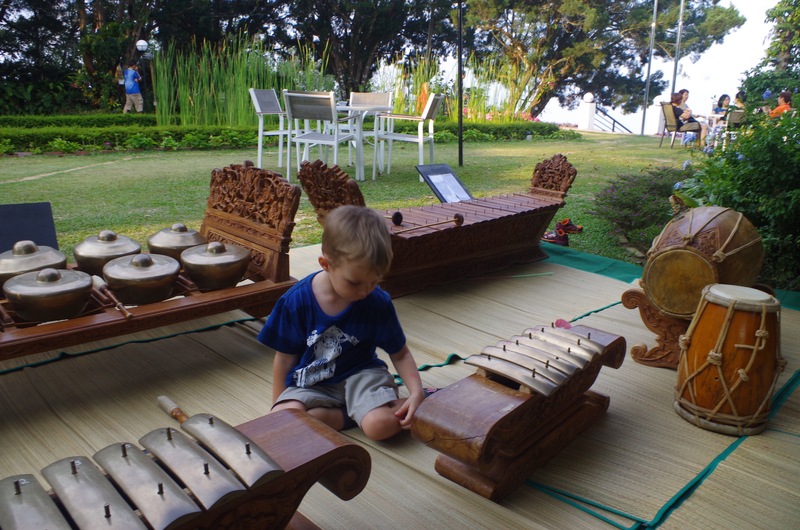 They let Simon check out the instruments. My first cocktail in nearly a year. In the morning, I woke up and went for a walk while the rest of the family slept in. I was hoping to get some pictures of the sunrise, but it was too hazy. 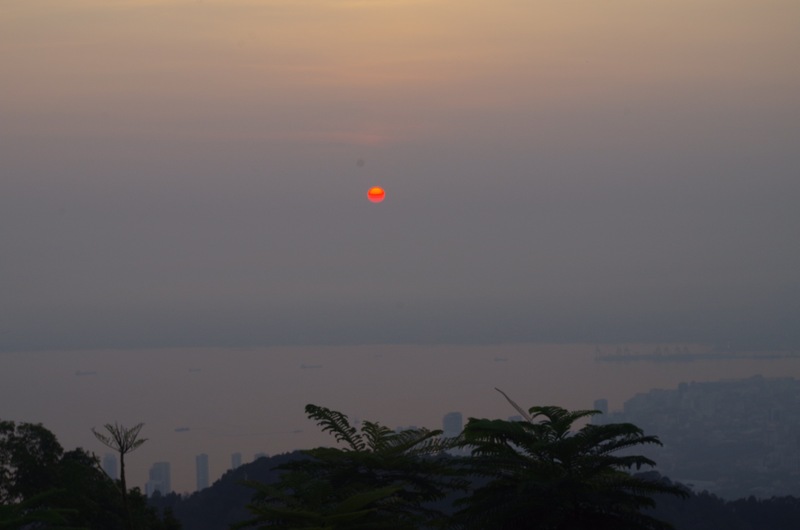 Smoke from the Indonesian forest fires has been blowing over Penang for months now. But I was in for another treat: cool air. When I walked out of the hotel, I actually felt a bit chilled. I bet the temp was only 65*F or so. After months of unending heat, it felt luxurious. That alone was totally worth the overnight stay on top of the hill. My cell phone got a better picture than my DSLR. 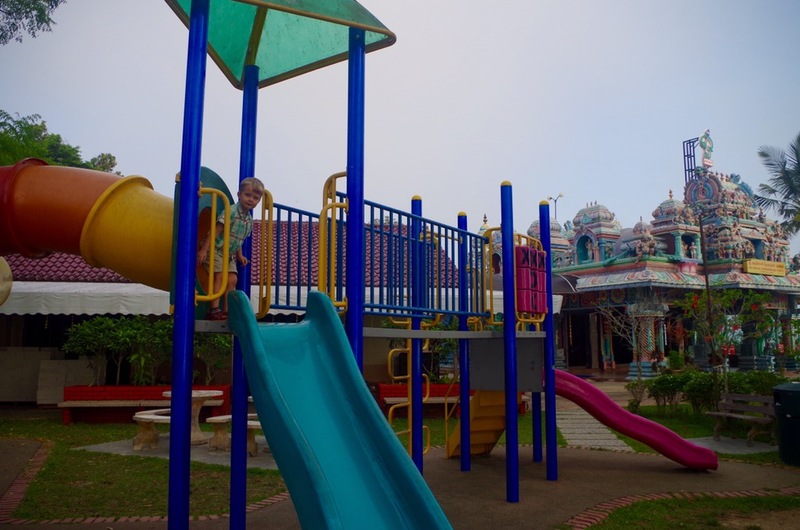 When the rest of the family woke up, we took Simon to the playground, which is sandwiches between the mosque and a Hindu temple. 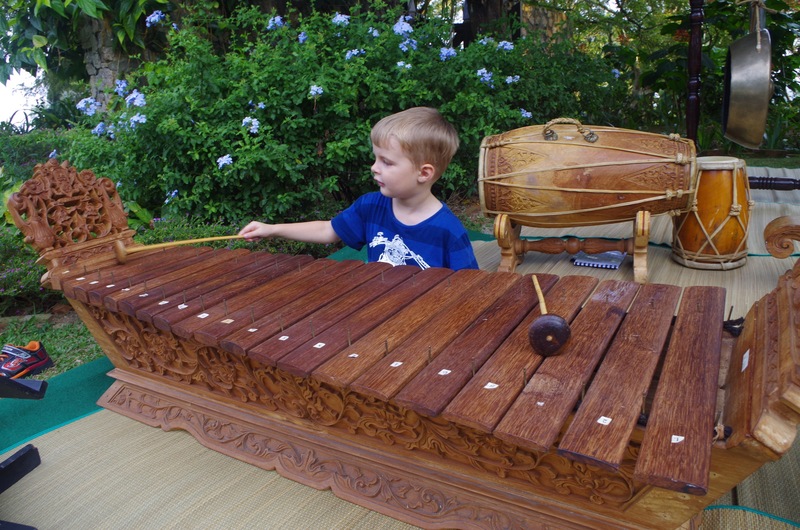 Simon played on the equipment while Joel and I visited the temple. 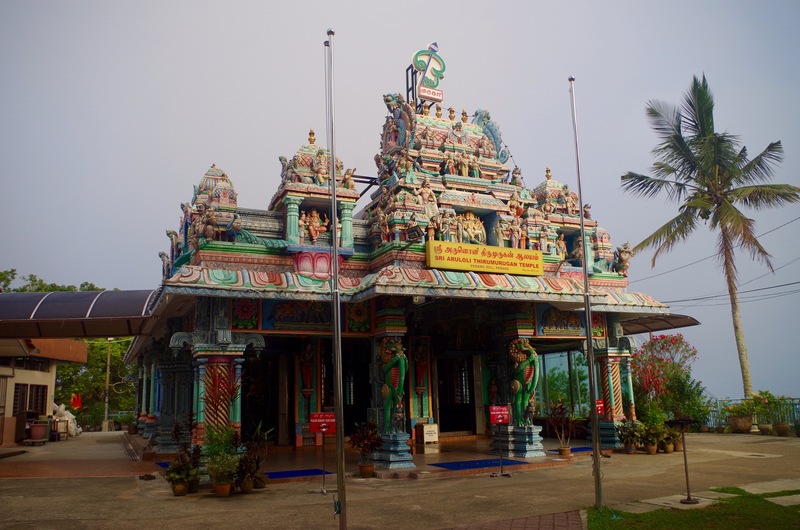 Playground with temple in background. I don’t know what exactly he is, but I liked this guy. Maybe not cut out for the infantry. 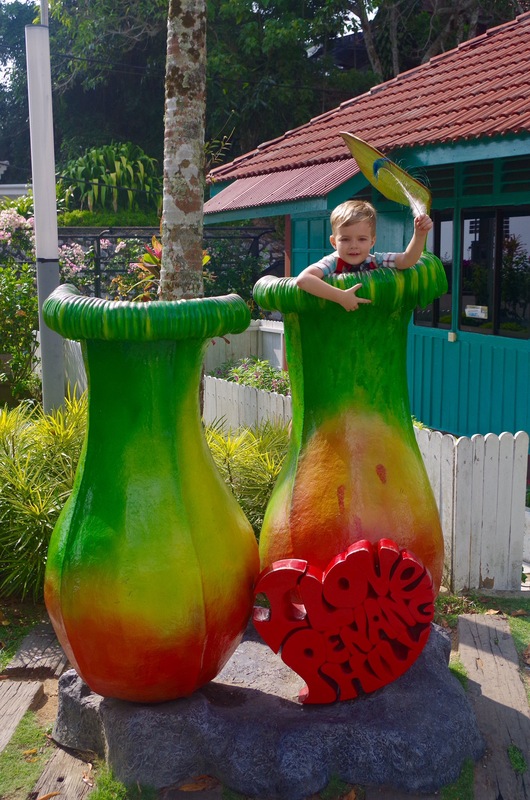 Carnivorous pitcher plants–known locally as monkey cups–are common on Penang Hill as well as other locations around the island. From there, it was time to go home. 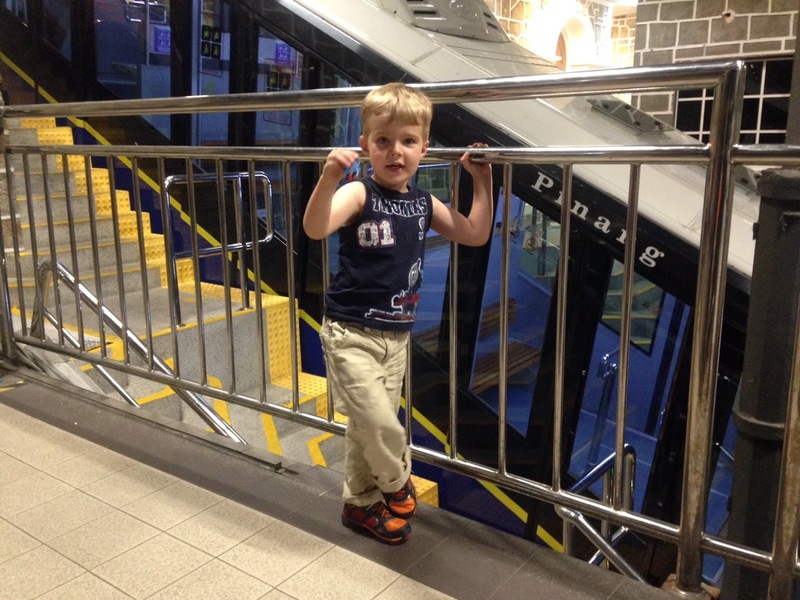 We boarded the funicular train and managed to get into the front car. Even better yet, the passengers let Simon sit by the big window. There’s always a bit of shuffling and jockeying for the good seats, so this was really special. We rode down–it was every bit as exciting as a roller coaster–and caught an Uber home from a very busy weekend. 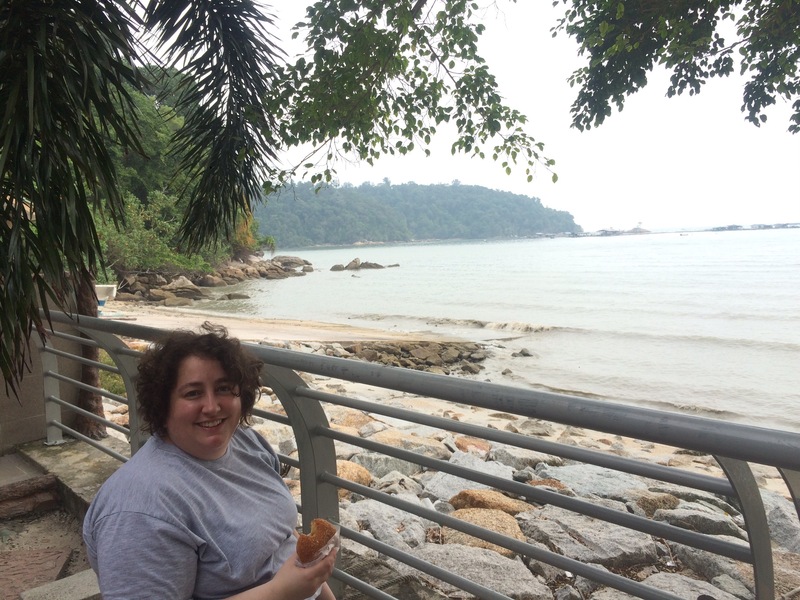 Brandy had been in Penang for a couple of days at this point, and she still hadn’t seen much nature. 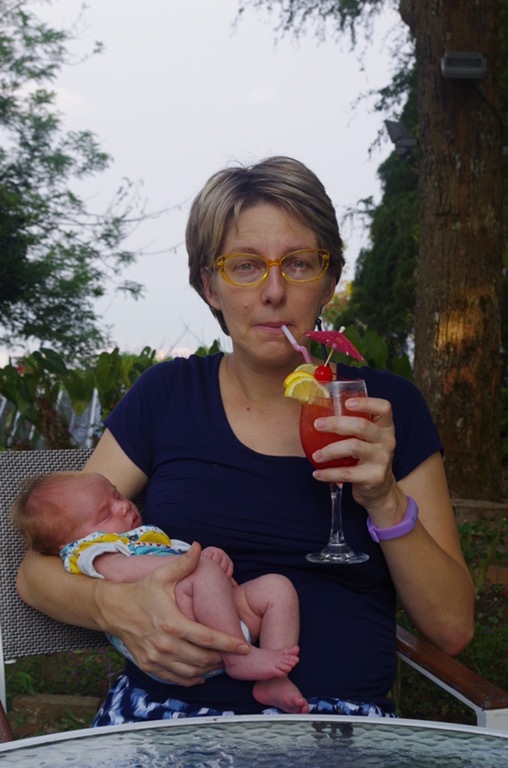 It’s just so hot here, and with a newborn baby in tow, it’s hard to get out of the A/C. 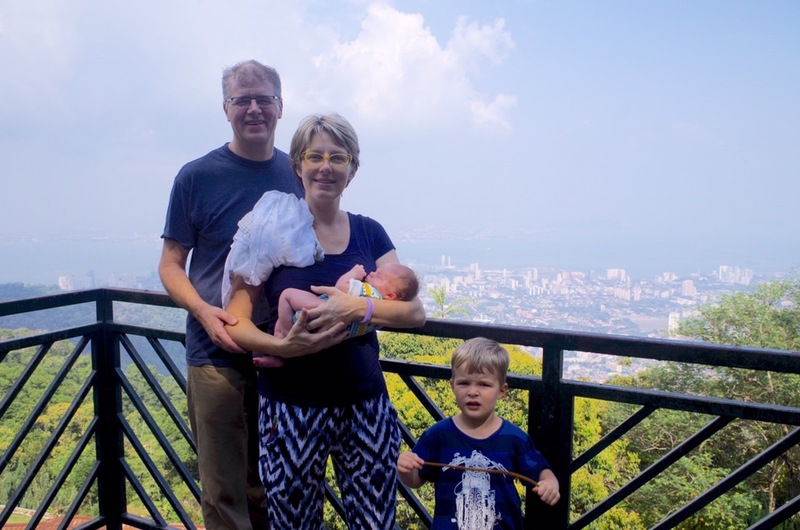 Still, we wanted her to get to experience some of Penang’s nature along with all the food and culture we’d been able to show her so far. One day, Brandy and I accompanied Simon on a trip to the Botanic Garden. 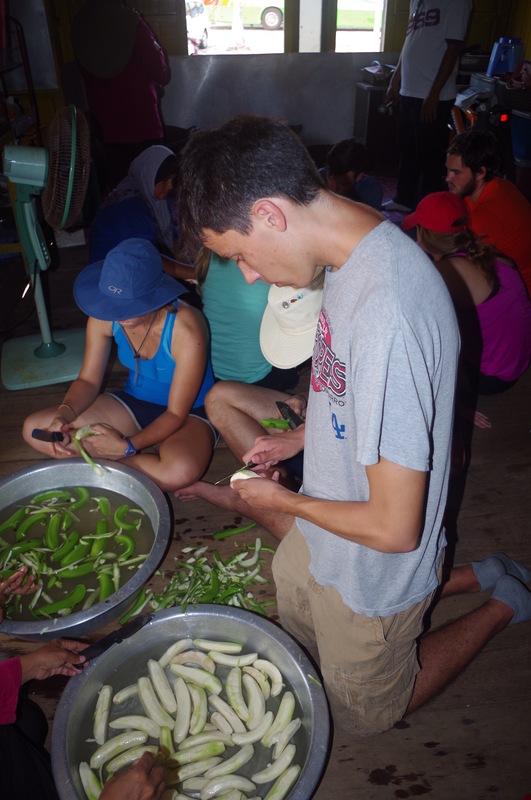 Simon was able to give Brandy a clear description of proper monkey protocol: don’t carry food or the monkeys will steal it! 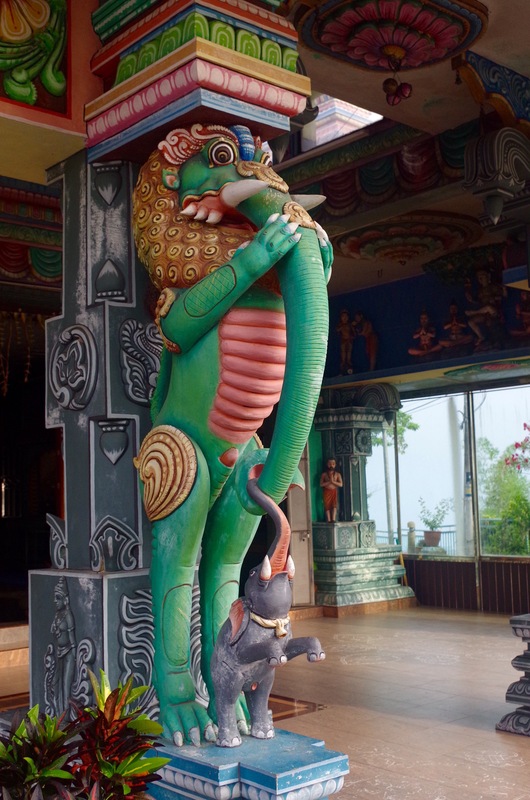 But in addition to monkeys, we saw some other really cool wildlife. And Simon was the first to spot much of it: he was the first to see the salamanders on the path to the lily pond, probably because he was at a better angle to peer into the underbrush. 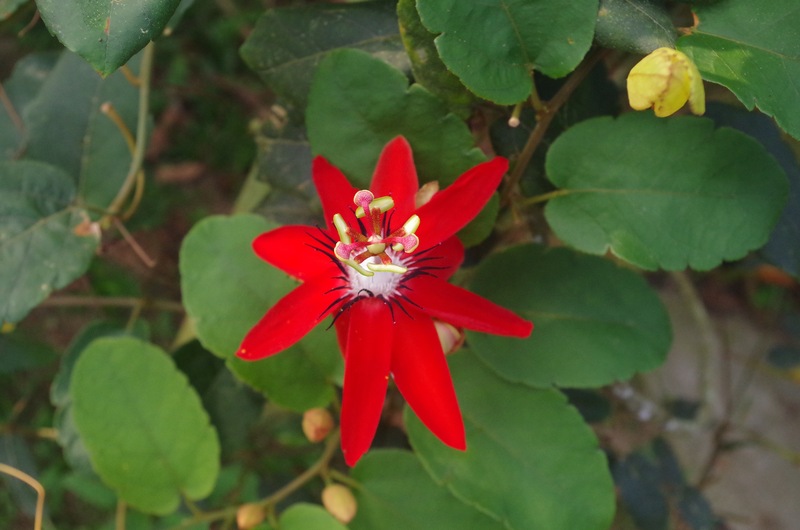 And while Brandy and I were staring at the mostly empty lily pond, Simon called out that he saw a beautiful red bird. At the time, Brandy and I both agreed it must be some sort of bee eater. 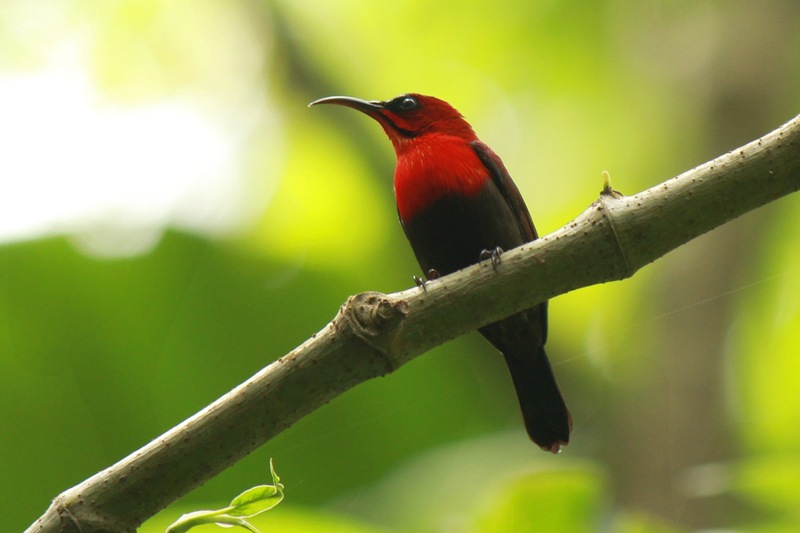 But having done a little investigating (erm, “googling”) I now think it was a crimson sunbird. Brandy, what do you think? 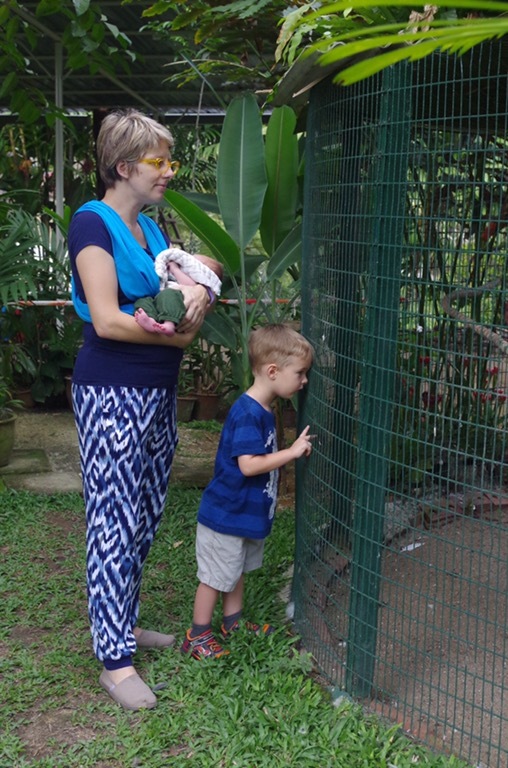 In addition, we saw TWO monitor lizards–one climbing a tree and one warming itself in a sunny patch of grass. I’ve long considered Komodo dragons to be one of the most terrifying animals on earth. These guys are relatively close cousins to Komodos, and seeing how well that big lizard climbed a tree reinforced my fear. 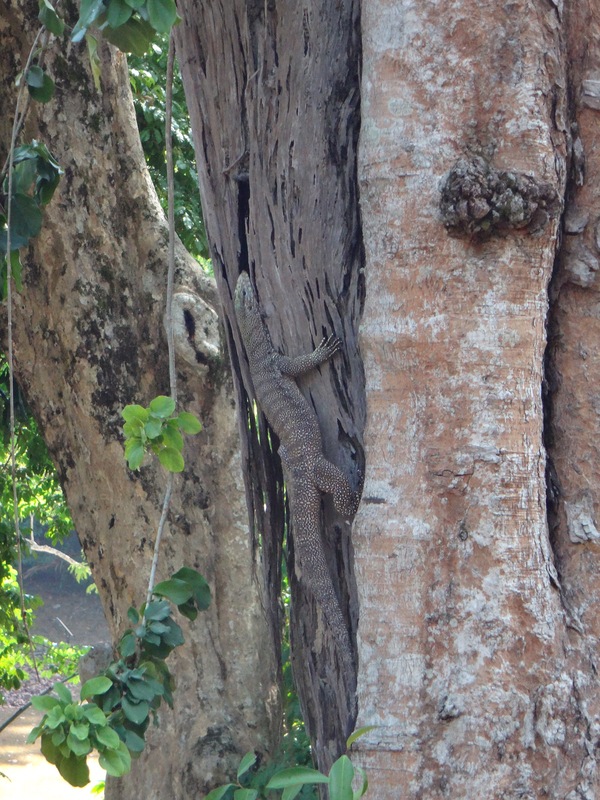 He’s a bit camoflaged, but there’s a monitor lizard in this tree. You see it yet? He’s close to a meter long. 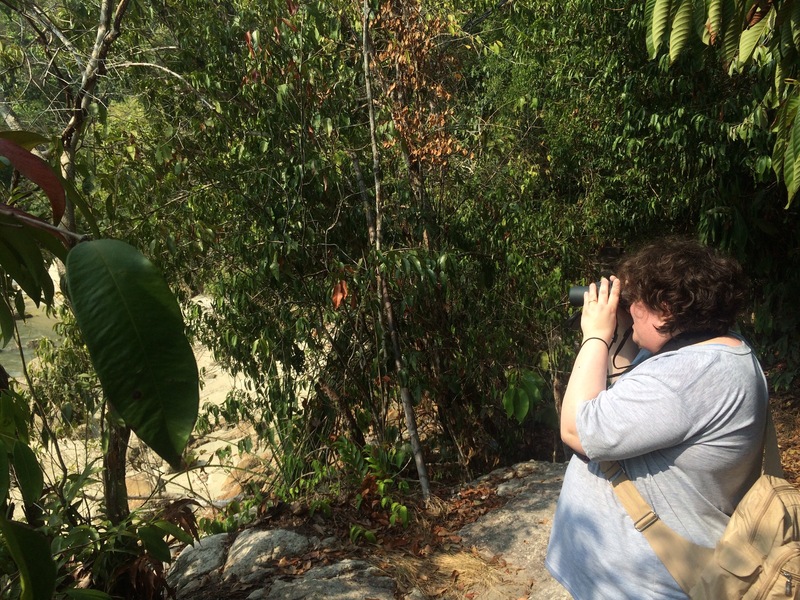 On another morning, Joel and Brandy took a hike at Taman Negara, Penang’s National Park. Simon stayed with our babysitter, Thiva, and Penelope and I had doctor’s appointments. It sounds like it was a hot, humid climb but they were rewarded with some more wildlife sightings. The highlight was probably the mudskippers. 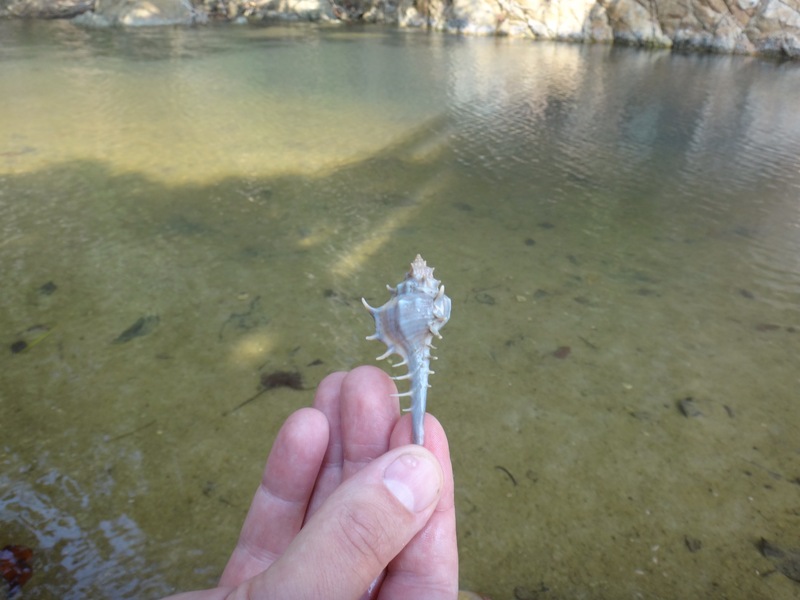 Joel and I saw mudskippers once in Zhuhai, but I think the ones here in Penang were a little more actively skipping mud, as mudskippers are wont to do. When they were done hiking, Penelope and I took an Uber to Batu Ferringi to meet the hikers and we all had lunch together at a little place called the Living Room. I picked out this place particularly for its beef rendang, which is a Malaysian specialty. It’s slow-cooked beef, flavored with coconut milk, lemongrass, ginger, and garlic. Sounds amazing, doesn’t it? Yes, and it tastes even better. Best of all, those are all ingredients that are easy to acquire in the U.S. I envision perfecting a crockpot version of this recipe when we get home.